The Larson Electronics MPD-20C-240.1P-10KVA-4X120-2X240 power distribution substation converts single-phase 240V AC electrical current into single-phase 120/240V AC. This unit provides operators the ability to safely tap into and distribute 240V AC power from a variety of sources including generators and direct grid power. The MPD-20C-240.1P-10KVA-4X120-2X240 portable power distribution system gives operators the ability to power their 240 volt and 120 volt equipment from a single system. On the primary side, operators connect 240 volt line-in power via 20` of #6 SOOW cord. On the secondary side, operators connect to four 6-15R receptacles for 240V equipment, to two 5-20R GFCI receptacles for 120V equipment and to two 5-15R GFCI receptacles for 120V equipment. All receptacles are equipped with weatherproof covers. Operation: A 20` #6 SOOW cord brings 240V single phase power to the NEMA 3R 60-amp 240V single phase primary disconnect, which contains two 50-amp time delay fuses, and passes power through to the transformer. The NEMA 3R 10 KVA transformer converts 240V to 120/240V single phase and passes the current to the secondary panel. The secondary side of the transformer feeds a NEMA 3R 50-amp 120/240V single phase main circuit breaker panel. This secondary panel contains two 15-amp 2-pole 250V breakers protecting four 15-amp 250V 6-15R receptacles, two 20-amp 1-pole 125V breakers protecting two 20-amp 125V 5-20R GFCI receptacles and two 15-amp 1-pole 125V breakers protecting two 15-amp 125V 5-15R GFCI receptacles. Protective Construction: Unlike many portable power distribution boxes made of plastic and utilizing thin gauge, low grade metals in their construction, this unit is designed for serious use and is ruggedly constructed to withstand demanding conditions and heavy duty industrial applications. The transformer and load assembly is mounted on a 3/16" thick carbon steel mounting platform and the load center/distribution assembly is mounted to the standard 2" x 2" x 1/8" square carbon steel tubing frame, resulting in an extremely stable, durable and well protected power distribution platform. This model is equipped with forklift skid pockets, locking casters, and a top located lifting eyelet allows easy lifting with cable or chain hooks. This can be replaced with stainless steel, hot dip galvanized steel, or aluminum depending on the customer’s needs for an additional cost. Larger units are available upon request, and can be equipped with skids or trailer mounted. Certification: Larson Electronics is a UL 1640 panel shop and certified to build portable power distribution systems. All units are built in accordance to NFPA 70 (National Electric Code) and certified to UL 1640. All equipment is NEMA 3R rated for indoor and outdoor use and provide a degree of protection against dirt, water, and ice. NEMA 4 and NEMA 4x equipment can be equipped upon request. 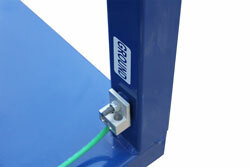 Grounding: Transformer is grounded to the frame and we provide a grounding lug on the frame for the earth ground. Applications: This power distribution system is ideal for indoor or outdoor use and applications including but not limited to, construction sites, plant maintenance, plant turnarounds, shows, exhibits, and shipyard operations. These power distribution systems are popularly used in applications where external power sources are often necessary. We also offer class rated transformers for use within explosion proof and hazardous location environments. Custom Built Systems Available: Larson Electronics is a manufacturer and we can build portable power distribution systems to your specifications. Although we carry several models of portable power distribution systems in stock, we can deliver custom ordered units almost as quickly as our prebuilt units. If this model does not meet your needs, please contact us at 1-800-369-6671 or sales@larsonelectronics.com to discuss your specific requirements.